Energy Developments – LNG & CNG energy solutions. EDL Energy LNG and CNG Energy Solutions help customers to switch from diesel to viable, alternative long-term energy source for power generation and transport. Home / Natural Gas Vehicle / Compressed / Energy Developments – LNG & CNG energy solutions. EDL will continue to pursue opportunities to assist customers to switch from diesel fuels to Liquefied Natural Gas (LNG) and Compressed Natural Gas (CNG) as a viable, alternative long-term energy source for power generation and transport. We are experienced in pipeline gas, LNG, CNG and diesel fuel and with reciprocating, open cycle and closed cycle gas turbine generation technologies. We have the capability and the experience to match the best fuel and generation solutions with renewable energy or waste heat recovery technologies to meet our customer’s needs. This market opportunity has been created by the widening gap between the global price of diesel/oil fuels and natural gas in certain markets. This strategy is particularly relevant in remote areas where there is limited or no existing energy infrastructure such as gas pipelines or electricity grids. In Karratha, Western Australia, Energy Developments has built and operates a 200 tonnes per day LNG production facility as part of the West Kimberley Power Project (WKPP). This operation has allowed EDL Energy to deliver long-term low emission power supply to the towns of Broome, Derby, Halls Creek and Fitzroy Crossing in the booming Kimberley region of Western Australia. We have also developed an innovative haulage system for delivering CNG to remote power stations that service mining operations and remote communities. LNG is created by chilling natural gas to minus 161˚C, turning it to liquid. During this process, the gas is reduced to one 600th of its original volume, making it economical to transport long distances in this form. 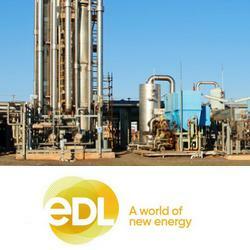 Go on EDL’s Website or contact them to get more informations!